TIJUANA, MEXICO-In late breaking news Tijuana-based promoter Guillermo “Memo” Mayen informed the local daily newspaper Frontera his fighter current interim WBC atomweight champion Brenda “Bonita” Flores (15-4-1, 3KO) has withdrawn from her first defense against Louisa “Bang Bang” Hawton (8-2, 4KO) slated for Saturday, December 8th, at the StubHub Center in Carson, California. It was announced late Tuesday evening that Flores has been hit hard by a common cold and throat infection about nine days before the fight. The scheduled 10-round championship fight was part of the undercard presented by Tom Loeffler’s 360 Promotions which will feature the first ever female boxing double header televised on the HBO network with the considered pound for pound queen Cecilia Braekhus (34-0, 9KO) defending her undisputed welterweight crown against Aleksandra Lopes (18-4-3, 1KO) while WBC, IBF and WBA middleweight champion Claressa Shields (7-0, 2KO) defends her crown against Femke Hermans (9-1, 3KO). The cancelled bout is a huge blow for the 26 year-old Flores of Tijuana, México, but also for Hawton, 33, who earlier on Tuesday along with Braekhus hosted a media day in Los Angeles, CA, to promote the fight card. The fight was a rematch of their September 8th match up for the vacant title at the Forum in Inglewood, CA. After ten grueling rounds Flores, who was allowed to dispute for the green and gold belt despite not making the 102-pound limit with the WBC citing an obscure water retention rule to excuse her half pound overage, was awarded the title via a disputed split decision. Two judges saw it for the taller Flores with scores of 97-93 and 96-94 while the third scored it for the hard charging Hawton of Australia with a card of 97-93. Flores won her first world title in her second opportunity after dropping a unanimous decision a year ago to Silvia Torres, younger sister of the legendary Ana Maria Torres, for the interim WBA light flyweight title while Hawton, the WBO 108-pound champion in 2016, has been on the hunt for her second world title in as many divisions since making the jump from Australia and back in the ring earlier this year. 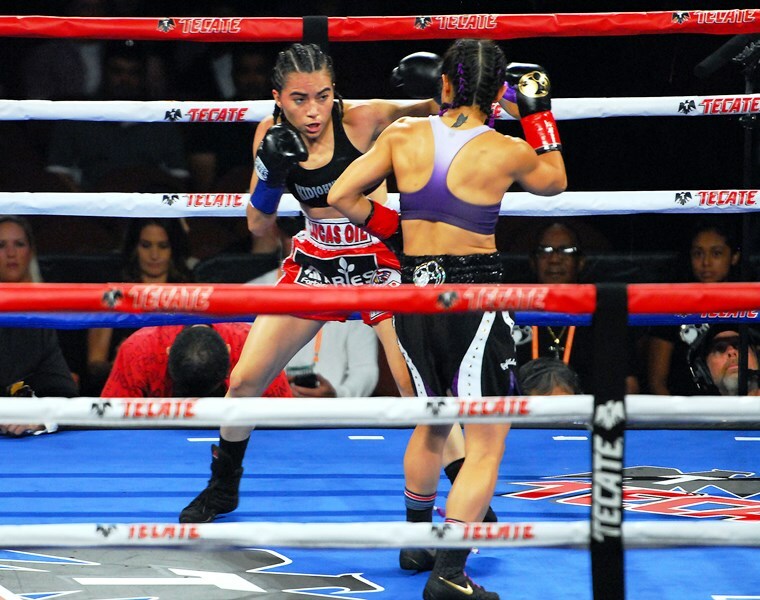 Since her loss to Torres, Flores went 2-0, 1KO, with a majority decision over Maria Goreti and a stoppage of Aurora Bautista before facing Hawton in early September in her first fight in the United States. Hawton’s road to the vacant world title shot has been much harder suffering her first pro loss in March against tough Mexican Anahi “Panterita” Torres on the undercard of Sor Rungvisai-“Gallo” Estrada at the Forum this past February. That fight marked the first for Hawton in the United States but more importantly her debut performance under the banner of 360 Promotions. She bounced back four months later with a stoppage of Elvia Trevino in four of a scheduled six before facing Flores the first time. In the first fight Hawton was at a disadvantage not only in weight since it was the first time Flores dropped down to 102 pounds after campaigning for the better part of her six year career between 108-112 pounds but also in height since the Mexican towered over her with what looked more than the reported two inch difference. Hawton went to work darting in and out pushing Flores around the ring with her sheer aggression. Flores got into her rhythm by the fifth round and began to counter punch Hawton as she came in aggressively without much abandon. In the second half of the fight Flores landed the sharper punches while Hawton scored more but without power behind them. According to Flores’ promoter a new date is being sought while Hawton is scheduled to fight on December 8th with a new opponent, if found at such short notice, to be announced.